Robert Peary, even while he was still a boy, began preparing himself for the long expeditions* he would make later in life. When he was young, he would make 25-mile hikes every week. 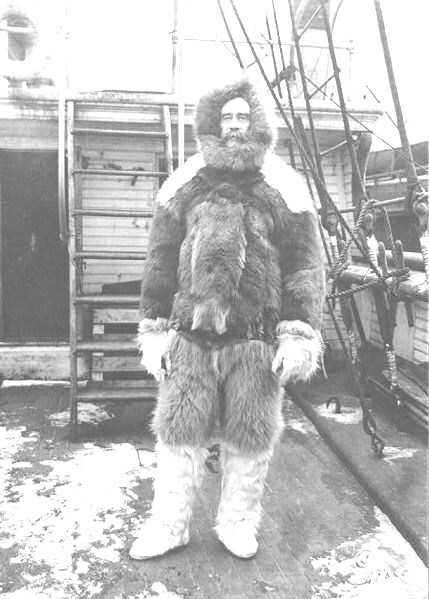 He had prepared himself well for polar exploration by studying the Inuit people who were native to the land. From them he learned how to build igloos, drive a dog sled, and make warm clothing out of animal skins. On the first expedition eight of his toes froze and had to be removed. Later he would have the remaining two toes amputated* because it was easier for him to walk with no toes than with only two toes. On his second expedition both his legs were broken in a ship accident, but still he pushed on. He directed the construction of a base camp from his bed. When he was 25 years old he joined the Navy, and after his eighth expedition he was promoted to the rank of Admiral. * Sometimes he had trouble getting time off from his Naval duties to go on the expeditions. On his third trip to Greenland he discovered three of the world's largest meteorites. * One of them weighed 65 tons; 130,000 pounds. He was determined to bring it back and was finally successful in getting it to the American Museum of Natural History in New York. He gave lectures to raise money, and by 1908 he had raised enough to finance his eighth expedition. 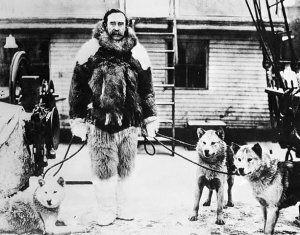 On the final part of the trip he was accompanied by five men; Matthew Henson, an African American, and four Inuits; Ootah, Egingwah, Seegloo, and Ooqueah. On April 7, 1909 he realized his dream of reaching the North Pole. 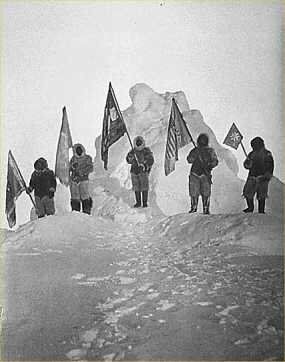 When he returned home, he learned that another man, Frederick Cook, claimed to have reached the pole a year earlier on April 21, 1908. Peary and his men tried to disprove Cook's claim. Some of Cook's documentation* proved to be false. Also they learned he had been accused of fraud in an oil deal and served seven years in prison. He was eventually pardoned, but his reputation was ruined. There was also controversy concerning Matthew Henson, who also claimed that while he was in Peary's party, he was the first one to reach the Pole location. Robert Peary died in 1920. He was 63 years old. Peary had a son by an Inuit woman. This son later visited his father's family and his gravesite in Arlington National Cemetery in Washington, D.C.
"Famous Discoverers and Explorers of America"
"Adventures of Uncle Sam's Sailors"
At biography.com search for Robert Peary. Robert Peary, First to the Pole? When did you publish this page? This page displayed 99,544 times.